2. Click My Email underneath the My Products and Services tab. 3. Click Manage next to your Microsoft® Hosted Exchange Service. 4. Select Go next to the Action Item that asks you to Assign a Domain. 5. From the drop-down menu, select the domain name you want to assign. If your domain name is not registered with Network Solutions, you should select the option that says "If you would like to assign a domain name that is not listed, click here." 6. Please allow 30 minutes for the domain to assign on the server. Creating mailboxes before the domain is fully assigned can cause issues when setting up mailboxes. 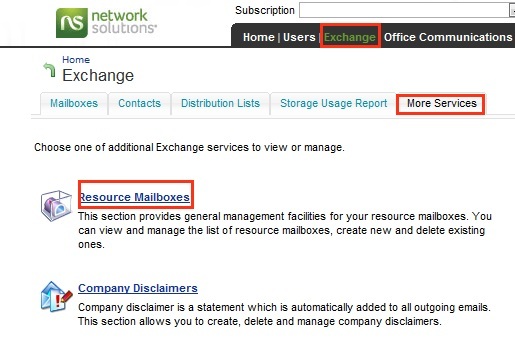 Note: Before you can assign a domain name to your Hosted Exchange package you must first unassign any nsMail boxes that are configured at that domain name. 1. Once your domain name is assigned to your Hosted Exchange package, open the Control Panel from the Hosted Exchange Overview page. 2. 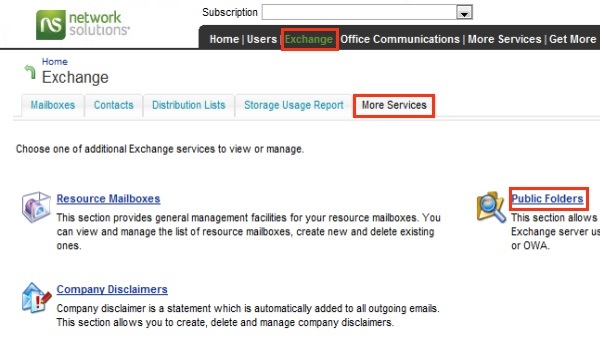 From within the Control Panel, select Exchange - Add New Mailbox. 3. Enter the Display Name, Login (email address), and Password. Note: The minimum length for password is 6 characters of different types (uppercase and lowercase letters, numerics, special characters). If there are only three different types of characters, minimum length is 7. If password is word-based, or there are less than three different types of characters, minimum length is 8.There should be enough different characters in password, number depends on password class (more for word-based password or password with few different character types). 4. Select the domain name from the drop down for the email address you want to create. 6. Confirm the email address and add or change the alias if needed. 7. 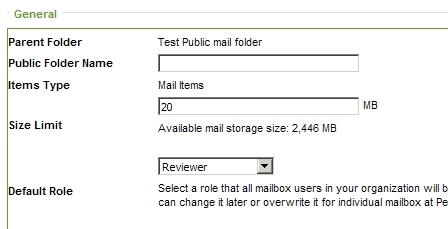 Select the Size Limit you want to set for the email box you are creating. 8. Check the box next to the access methods you need for that email box, including ActiveSync if you have purchased it. Note: You must choose at least one access method. 10. 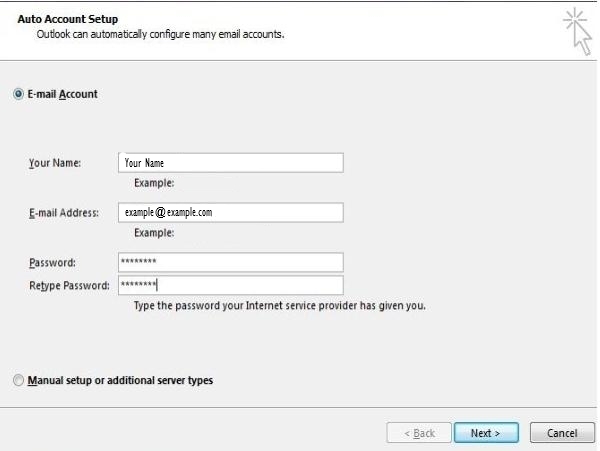 If you enabled Outlook Web Access(OWA), that user will be able to login to their webmail by typing https://email.hostaccount.com/owa into their browser. Note: The username for OWA is case sensitive. Use the full email address exactly as it shows in the Control Panel. Also, creating an Exchange mailbox will also create a Service User. If you set up the Service User and do not choose the option to add Exchange, you will have a login with no mailbox attached to it. Boundary Defense for Email is the SPAM filter provided with your Exchange service. You are responsible for setting up and managing this service. 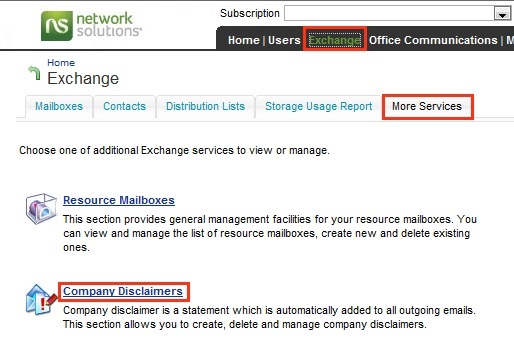 See the Help & Support tab of the Hosted Exchange Control Panel for setup options and details. To get to Boundary Defense, click the link on the homepage for Boundary Defense for Email or go to the More Services tab. 2. Click the link to log in to control panel. 3. Log in with the login information from the previous page. 4. The first time you login it will ask you to set up your security questions to activate Boundary Defense. 1. Access the Mail option from the Control Panel of your computer. Note: The location of this depends on your Operating System. 2. 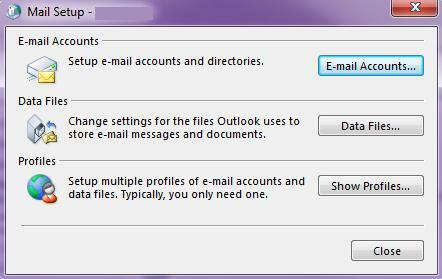 Chose the option for E-mail accounts unless you would like to create a separate profile first. A profile would be used if you would like to keep this email account totally separate from your others. If you are using any Outlook version previous to 2010 then this is a requirement. 3. Enter your name as you would like it to be displayed on your outgoing messages, your email address, and your password.When you are finished, click Next and the Auto-Configuration process will begin. 4. The next step will search for email settings. This typically takes about 5 minutes. In the course of the search, you will see a popup window that asks if you would like to allow Auto-Configuration to continue. Select Yes to this and select the box that says Always Allow. 5. Outlook will notify you that the setup is complete. Click Finish. Note: If you receive an error "The DNS may not have propagated to your location yet," it may take up to 24 hours to become fully functional. Distribution lists help you organize your addresses into groups that you can send to all at once. For example, you can create a distribution list called "Sales" and add all of your sales staff to that list. When you send a message to "Sales" it will deliver that message to everyone that is a part of that distribution list. 1. Select Exchange, Distribution Lists, Add New Distribution List. 2. On the first panel of the Add New Distribution List wizard, enter an Alias, Display Name, and Email Address for the new distribution list. 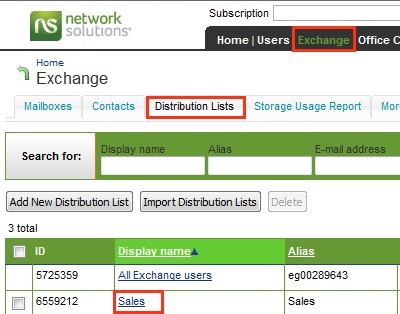 Keep the check mark next to Show in Address Book, this will display the distribution list in your organizations global address list (GAL). 3. Next you will need to select a security level to determine who this distribution list can accept messages from. Everyone: Everyone inside and outside of your organization can send messages to this list. Organization: Only members of your Organization can send message to this list. Members: Only members of the list can send to it. 4. Click Submit to create the distribution list. You will notice that it will have a status of Creating for a few minutes. Once the status changes to Ready then you can begin using that list. 5. 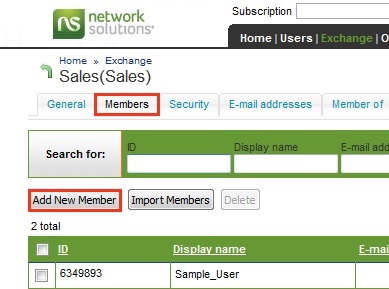 To add members select the list you want to add them to by clicking on the list's Display Name. Note: In order to add an external address you must first add that address to your Contact list. 7. A list of available users will display. Place a checkmark next to all of the users you want to include in the new distribution list, then click Submit. 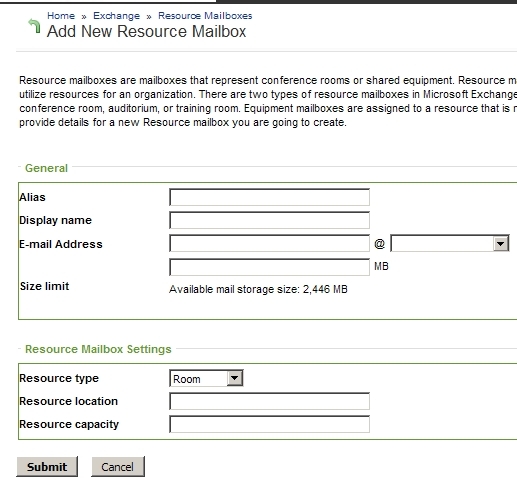 Resource mailboxes are created to represent conference rooms or shared equipment. They can be included as resources in meeting requests, and are used to provide a simple and efficient way to utilize resources for an organization. There are 2 types of resource mailboxes that you can create; room and equipment. Room mailboxes are assigned to a meeting location such as a conference room, auditorium, or training room. Equipment mailboxes are assigned to a resource that is not location specific, such as a portable computer projector, microphone, or company car. When creating a resource mailbox, make sure you include the details of the location and capacity. 4. Enter the location and capacity and click Submit. Now when you create a calendar event you can book a room or resource and see if it is available. This section of your Control Panel allows you to create, delete, and manage Top-Level Public Folders on your Exchange Package. Public folders are for mail items only. It is recommended to use a Shared Calendar or Contacts in an individual's mailbox for a group calendar or address book. 1. 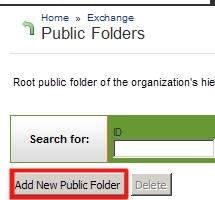 Click the Exchange Tab, More Services, Public Folders, then Add New Public Folder. 2. Select where you want this Public Folder added to, then click Next. 3. Type in the Folder Name, Size Limit, and select the Default Role that each user will have. 4. Click the checkbox next to Mail-Enabled to select to receive email from any email address or just the ones within your organization. Note: The Root Public Folder of the organization's hierarchy is auto-configured and is not editable. For example "P001049672". The company disclaimer is a statement which is automatically added to all outgoing emails. See http://www.emaildisclaimers.com/ for more detail regarding disclaimer usage. 1. To access this option click the Exchange tab. Then, select More Services > Company Disclaimers > Add New Disclaimer. 2. 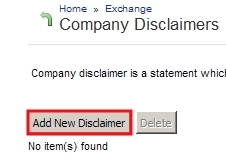 Enter a display name, select which recipients you want to receive the disclaimer and click Next. Congratulations! You have now set up your Hosted Exchange package and can now begin using your email address. 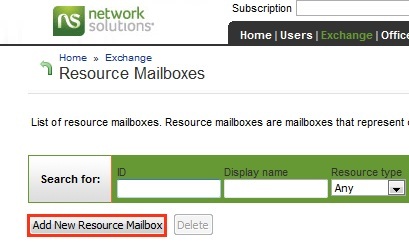 Network Solutions—How Do I Add a MailForm to My Website? Network Solutions—How Do I Get Started with Web Hosting? Network Solutions—How Do I Set Up a Hosting Package Mailbox?